Seville is a beautiful city which due to its large size and concentration of world heritage monuments tends to keep visitors within a fairly reduced area. This often leaves them with a rather limited impression of its particular character and uniqueness. Small secret buildings full of history and tradition, charming corners, artisan shops, hidden courtyards and cosy and quirky local tapas bars are not easily discovered due to the city’s many tourist attractions and multilingual restaurants. With this walking tour we will explore and learn about the architecture, identity and local everyday life of 4 different quarters in the city centre. We will focus on their history and differences in order to get a wide perspective of the city and its inhabitants. Along our way, we will visit two very special buildings and meet some local people who participate actively and on a daily basis in the most representative traditions of the city. We will go for tapas to two places where foodie Sevillanos usually gather with friends, and stop for some sweet indulgence in a famous local pastry shop too. 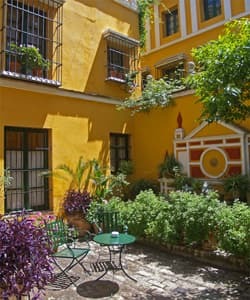 This tour is ideal for people spending a second or third day in Seville when they have already seen the world heritage sites or for those who are rather curious about what’s behind the scenes of the city. Meeting point: by the Cathedral tower. We can also meet you at your hotel if you are staying in Seville or at the train station if you are coming to Seville by train to spend the day. Prices: start at 52 Euros per person (incl. VAT) for a group of 8 people. Includes: your personal local expert throughout the itinerary and all entrances.